For many, the idea of “genetically modified” (GM) crops does not sit well. Opponents to GM crops, like Monsanto’s corn, worry that genetically altering the structure of food can have a profoundly negative impact on the body when it is eaten. Unfortunately, a recent study published by the University of Caen in France has validated such concerns. French researchers have released a study that links Monsanto’s GM corn with the development of cancerous tumors in laboratory mice. The study, which was conducted over a period of 18 months, is the first of its kind to truly investigate the long-term side effects of new “GM” food products. Published in the Food and Toxicology Journal, the French study focused on a specific type of Monsato’s GM food product: NK603 Roundup-resistant Corn (also labeled Maize in European nations). This specific type of GM corn is treated with a unique chemical to make it resistant to the herbicide glyphosate, which many consumers know by the brand name Roundup. In theory, treating corn with a Roundup-resistant chemical allows farmers to use greater volumes of herbicides to kill a larger number of pests. In turn, farmers are able to yield a larger and more valuable crop. The only question: Is it healthy for consumers? 1. The Current “Industry Standard” for Testing GM Foods is About 3 Months. Such tests have produced little evidence that GM foods are harmful. 2. 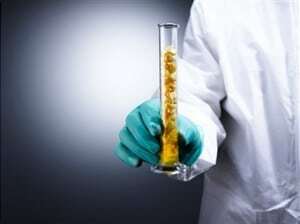 Researchers at the University of Caen Tested GM Foods Over 18 Months. To better understand the long-term side effects of GM foods, French researchers extended the typical testing period by 6 times its usual length. 3. A Majority of Cancerous Tumors were Found At or Around 18 Months. With a longer testing period in place, researchers were better able to assess the potential long-term side effects of GM foods. Alarmingly, a majority of laboratory mice developed cancerous tumors at or around the 18 month of being fed Monsato’s NK603 Roundup-resistant Corn, a common food product available in grocery stores around the world. Up to 50 percent of males and 70 percent of females died prematurely, compared with only 30 percent and 20 percent in the control group, and treated rats developed 2 to 3 times more large cancers than the control group (i). Russian authorities have suspended the import and sale of Monsato’s GM corn while consumer-rights regulators further review the research. Just north of the United States, Canadian officials are deliberating over halting imports as well. The study has broader implications, as authorities in France, Austria, New Zealand, and elsewhere are beginning to reevaluate the safety standards that have deemed cancer-causing GM foods “safe” in the past. Prop 37 gives us the right to know if our food has been genetically engineered. It helps us make the right food choices for our families by putting a simple label on the groceries we buy and telling us if our food has been genetically engineered. Readers are invited to learn more about Prop 37 by visiting CArighttoknow.org. (i) Kelley, Michael. “Monsanto’s Roundup And Roundup-Resistant Corn Found to Be Toxic.” September 19, 2012. Businessinsider.com.